WATCH Warhol Found on Reality TV Show? An estimated $30 million Andy Warhol painting of the late actress Farrah Fawcett that has been missing since her death two years ago might have been found in the home of her lover, Ryan O'Neal. She had willed the painting to her alma mater. A similar looking picture was seen in his bedroom on his new reality-TV show with daughter Tatum O'Neal. Fawcett did not include O'Neal, her on-again, off-again boyfriend of 30 years, in her will. Several of her friends say he has been controlling her estate. O'Neal's representative said he has not betrayed her final wishes and that "all of Farrah's wishes expressed in her will have been fulfilled." As the two-year anniversary of Fawcett's death approaches, June 25, her estate is far from settled. There's an active investigation into her missing artwork, including the Warhol portrait of Fawcett. 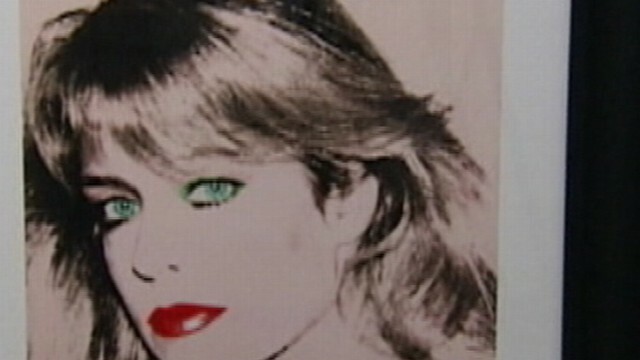 Warhol made two portraits of Fawcett in 1980 and both could be seen hanging in her home in the 2009 NBC documentary about her battle with cancer, "Farrah's Story." In her living trust, Fawcett left all of her artwork to the University of Texas. After the Charlie's Angels icon died on June 25, 2009, the University of Texas hired a private investigator because of art missing from the Fawcett collection. The university asked for the help of Craig Nevius, a close friend and business partner of Fawcett. He has been fighting O'Neal over her final wishes, he said. Nevius found a clue in the new tell-all autobiography written by Tatum O'Neal. In the memoir, "Found," she mentioned that the painting is hanging in her father's Malibu home. "There are pictures of us and the rest of the family ... Andy Warhol's portrait of Farrah," she writes in the book. "That was a 'Thank God, we've caught you' moment," Nevius said. "I told the university, 'Be patient and wait, because this man is so arrogant, he's going to show it.'" The missing Warhol painting might have been discovered this weekend when the reality-TV show, "Ryan & Tatum: The O'Neals," debuted on the OWN network. A painting that looks similar to the missing Warhol was visible hanging just above Ryan O'Neal's bed. $30M Farrah Fawcett Pic Found on TV Show?